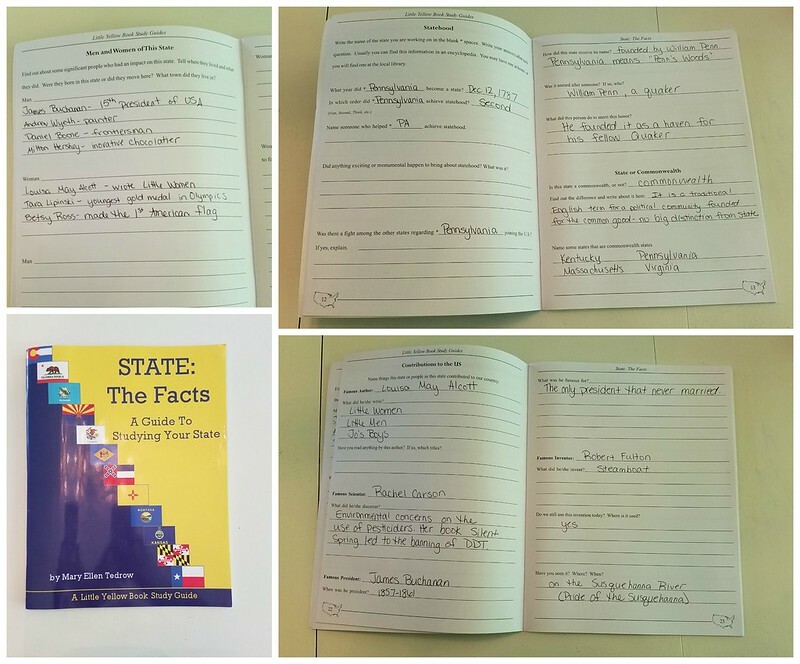 We have been using Laurelwood Books to complete one of or state's homeschool requirements of learning our state history by using State: The Facts A Guide to Studying Your State. State The Facts is a study guide designed to lead you through learning about your state. State the Facts is simply a workbook designed to help lead you through research for your state. It isn't specific to one state so it can be used by any person wanting to study any state. Most of the information can be found online, but the workbook urges you to seek out more information. There are sections for you to speak to your librarian, borrow and read books, call state representatives and learn about the politics in your state, history, and much more. This could be used as a single unit over the course of a couple weeks or spread out over a year. You could even get a few workbooks and learn about more than one state! There is a ton of writing required for this workbook and since my son HATES writing, I decided to help him out and do most of the writing for him. He was in charge of the research and telling me what I should put down. What I found interesting about this book is that it was a springboard for discussions and his own independent research and reading. It inspired him to want to start putting together field trips for next year. I think it depends on how you approach this book. I approached it as a notebook to hold our discoveries. It was the backbone of learning but we did more activities outside of this book to make it fun. Some of the activites we did outside of the book (that the book inspired) was attempting to paint the state flag, driving through our state capitol, and going on a nature walk to find our state tree, bird, and animal. My son has a few field trips planned for next year so this will continue to be expanded upon. Please click on the picture to see the pages better. It is a lot of writing, and that could get boring for some kids. I didn't mind doing the writing for my son since he easily learns just from reading and orally telling me what he learned. I think this would be great for a state study unit for kids in grades 3rd-middle school-ish. Of course, it depends on the student. You could make it prettier by adding stickers, washi tape, or stamps. My daughter would want to do that since she is artistic and loves pretty things. My son, on the other hand, likes things clean so we didn't decorate it for him at all. The workbook is $13.95 online. Check out Laurelwood Books on Facebook.